peggy pointer pats a pony. 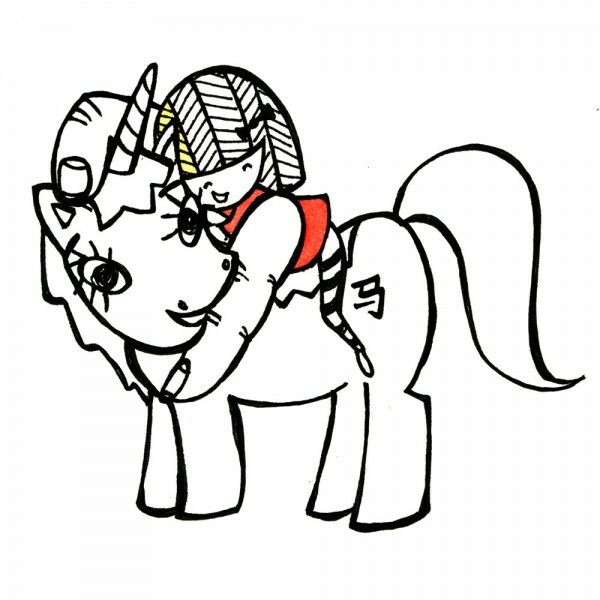 Happy Year of the Horse, everybody! Gong xi fa cai! Posted on January 29, 2014 July 1, 2016 Categories peggy pointerTags peggy pointer4 Comments on peggy pointer pats a pony. Photo courtesy of Christie Lau! In other news, I spent all the money I made that day on stuff that I thought looked cool and felt inspired by. That was fun. As for Peggy Pointer and me, our sales were slim, but some of my really kind friends bought books. That was REALLY nice of them. I’ve got some photos from the book-making process, so please let me tell you about my whole entire journey. I made up Peggy Pointer when I was in a REALLY boring meeting one day. At first her legs were also made of fingers, but these gave her a very bulky (not cute) appearance. I vowed to come up with a “Peggy Pointer p_______ a p_______” cartoon every day. But I quit for some reason. Months later, I decided to make the pictures I had into a book. But the illustrations were all inconsistent. So I re-traced 25 old Peggy Pointer drawings so that the line work would be consistent. I scanned all of the re-traced images into the computer, only to have Evan tell me they all looked “overworked.” Sigh. I arranged everything in InDesign. This REALLY made me wish I had worked on the yearbook in grade eleven because I felt like a headless chicken inside a computer. I PDFed my InDesign file and put it on a thumb drive. I sewed up each copy by hand. I put all the books in a stack. Yay!!!!! About to begin the sewn binding process. This is not an ad for Staedtler. Or is it? Sew threadfully boring. Frisbees make great containers for pencils and stuff. The most fun part of the whole process: adding random yellow to each page! No two books are alike. Oh! I also sold a bunch of rocks that I stole from the beach and drew on with a black pen and yellow Sharpie. I tried to turn the smaller ones into magnets but I didn’t mix the epoxy properly and so it didn’t work out. A box full of rocks! Not fun to carry. For some kind of magic spell. And guess what!!! I sold a grand total of 8 rocks to people who were willing to pay for rocks. For you economists out there, that’s a rate of 1.33333 rocks per hour. Unbelievable, huh?! Strangers are so kind. Stranger still, I was told by a girl who bought a rock that screenprinting every page of my book would have made me 58723710236% cooler. So that’s the secret?! But I think can live with being 58723710236% less cool than I could potentially be. But the strangest thing of all: when I changed the stickers from “$X” to “FREE,” people REALLY started to like them! Whoa!!! I also had an assortment of fingerless mittens up for sale. I sold two pairs. Yay. The end. Anybody want to buy a pair of mittens? peggy pointer pats the peepers. Posted on October 9, 2013 July 1, 2016 Categories peggy pointerTags peggy pointerLeave a comment on peggy pointer pats the peepers. 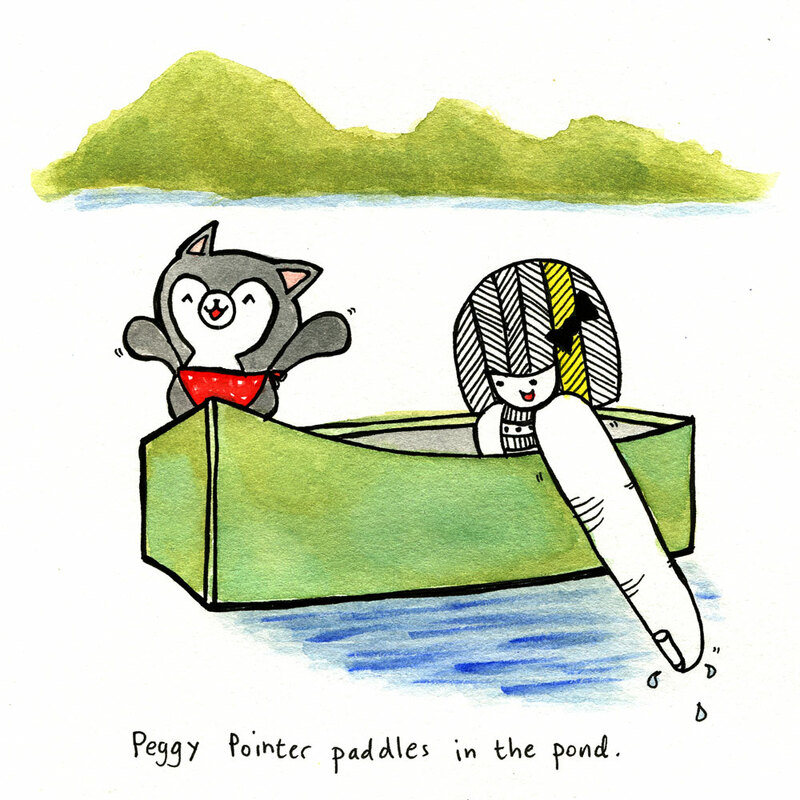 Posted on July 22, 2013 Categories peggy pointer2 Comments on peggy pointer paddles in the pond. peggy pointer pops a pimple. 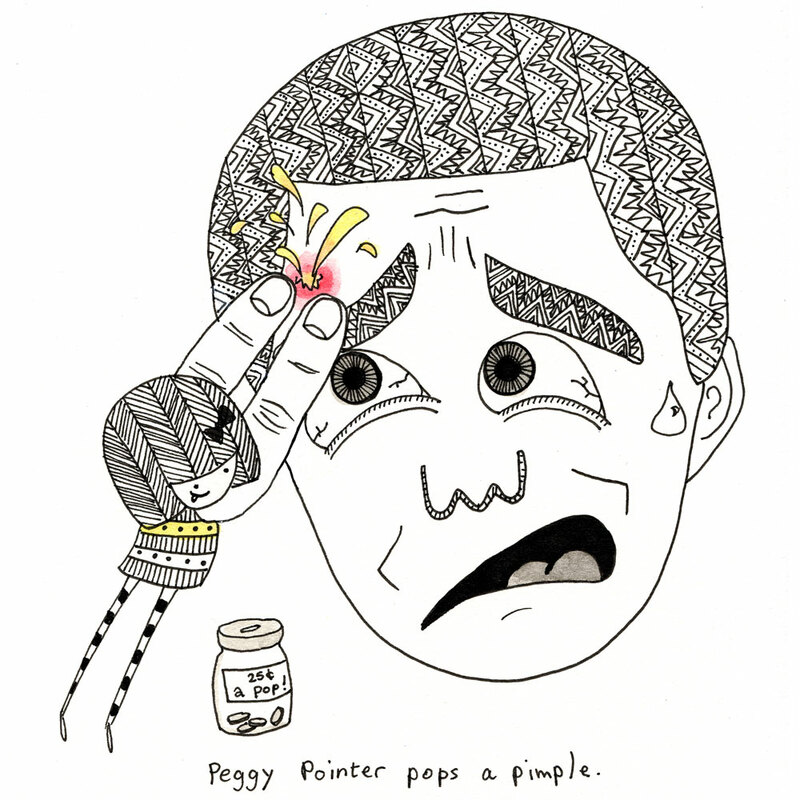 Posted on June 2, 2013 Categories peggy pointer3 Comments on peggy pointer pops a pimple. peggy pointer plays around in photoshop. 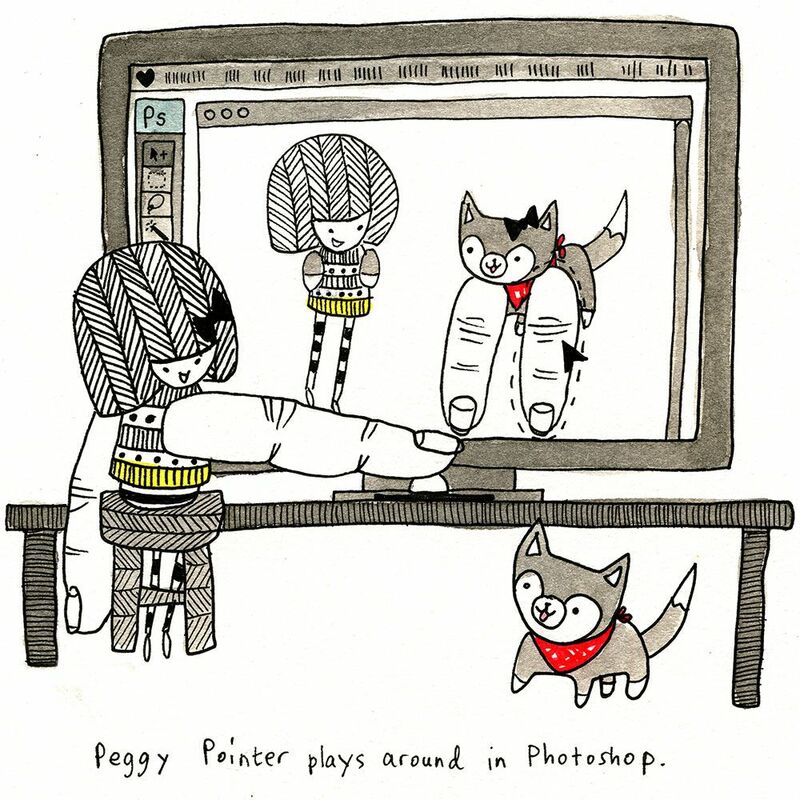 Posted on May 6, 2013 Categories peggy pointerLeave a comment on peggy pointer plays around in photoshop. 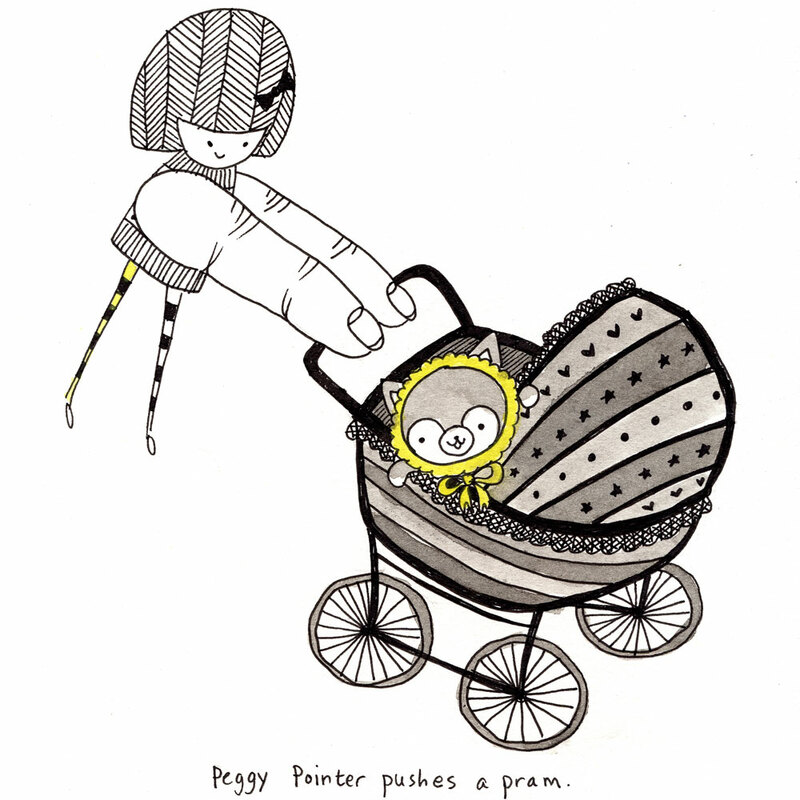 Posted on April 28, 2013 Categories peggy pointerLeave a comment on peggy pointer pushes a pram. 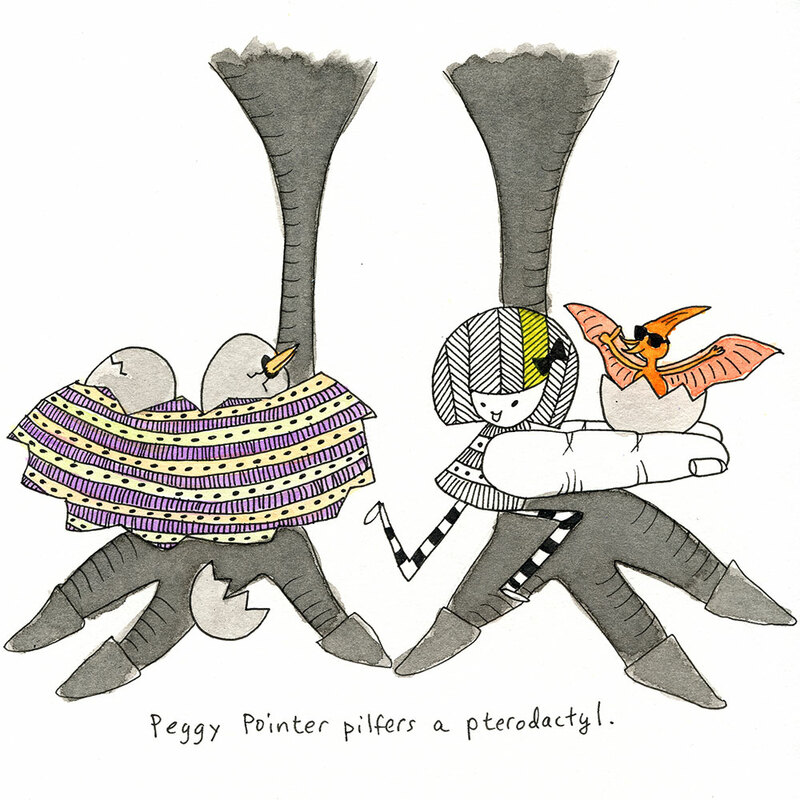 Posted on April 22, 2013 Categories peggy pointer1 Comment on peggy pointer pilfers a pterodactyl. 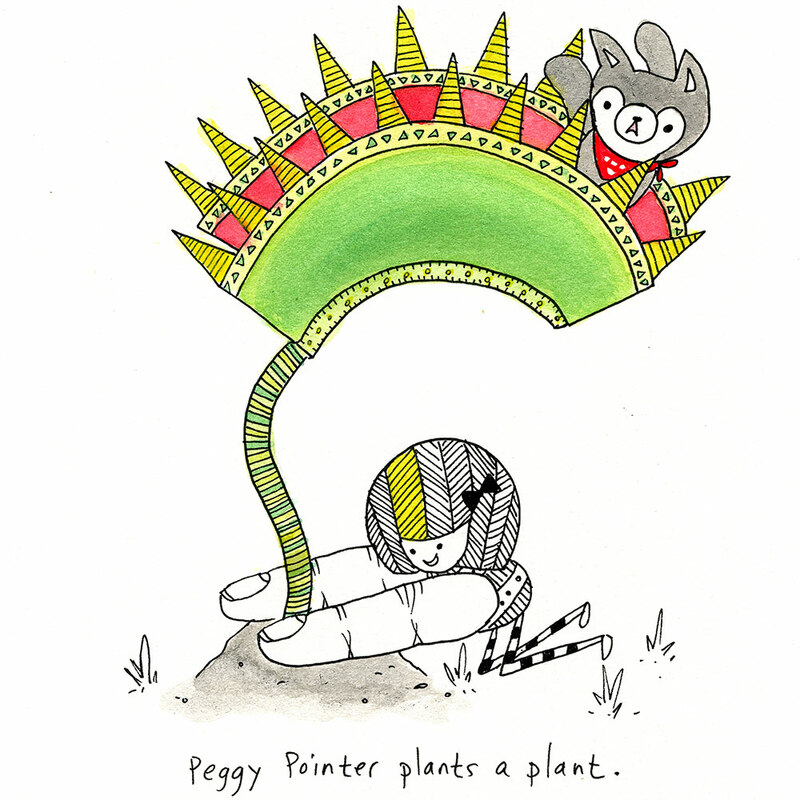 peggy pointer plants a plant. Posted on April 21, 2013 Categories peggy pointerLeave a comment on peggy pointer plants a plant. 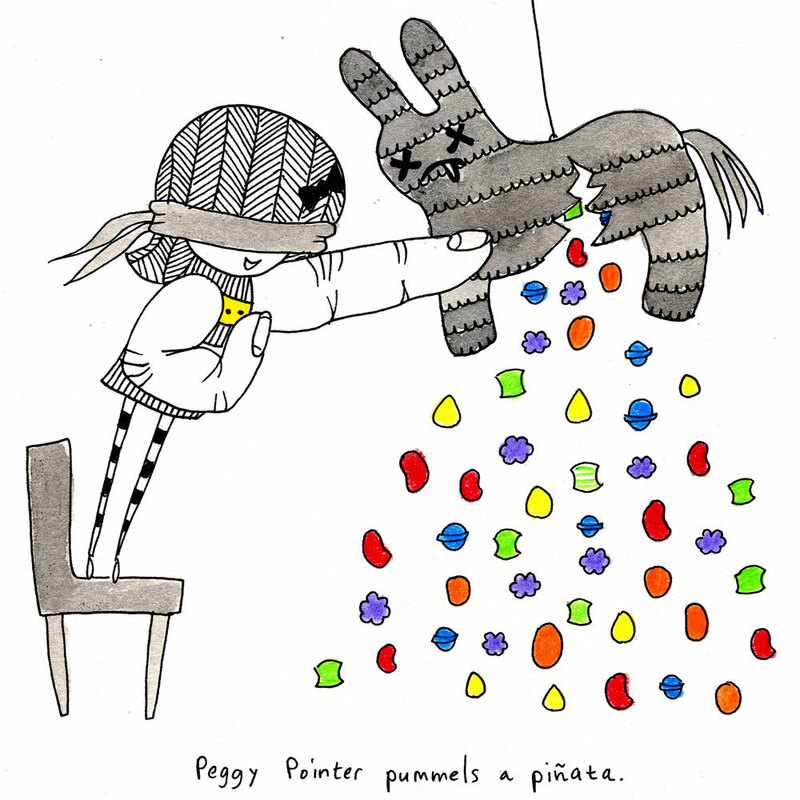 Posted on April 20, 2013 April 20, 2013 Categories peggy pointerLeave a comment on peggy pointer pummels a piñata.